University of Massachusetts Press, 9781558495029, 272pp. In the popular imagination, New York City's Greenwich Village has long been known as a center of bohemianism, home to avant-garde artists, political radicals, and other nonconformists who challenged the reigning orthodoxies of their time. Yet a century ago the Village was a much different kind of place: a mixed-class, multiethnic neighborhood teeming with the energy and social tensions of a rapidly changing America. 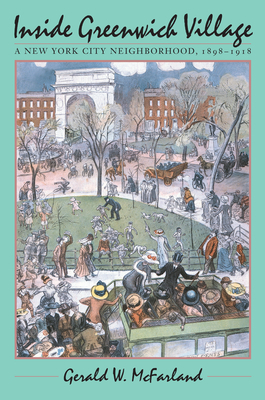 Gerald W. McFarland reconstructs this world with vivid descriptions of the major groups that resided within its boundaries -- the Italian immigrants and African Americans to the south, the Irish Americans to the west, the well-to-do Protestants to the north, and the New York University students, middle-class professionals, and artists and writers who lived in apartment buildings and boarding houses on or near Washington Square. McFarland examines how these Villagers, so divided along class and ethnic lines, interacted with one another. He shows how clashing expectations about what constituted proper behavior in the neighborhood's public spaces -- especially streets, parks, and saloons -- often led to intergroup conflict, political rivalries, and campaigns by the more privileged Villagers to impose middle-class mores on their working-class neighbors. Occasionally, however, a crisis or common problem led residents to overlook their differences and cooperate across class and ethnic lines. Throughout the book, McFarland connects the evolution of Village life to the profound transformations taking place in American society at large during the same years.